Prost! The annual Oktoberfest in Munich draws fun-loving crowds from around the world. 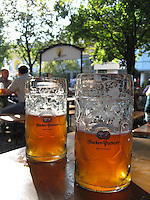 Revelers wear traditional dirndl dresses or lederhosen, clink beer steins and sing with oom-pa bands in massive beer halls.